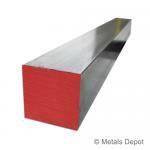 Metals Depot has a huge selection of Square Bar in a variety of metals. We will sell you any size and any quantity... no order is too large or too small. Square Bar is widely used throughout the fabrication industry: frame work, braces, trim, shafts, axles, fittings, instruments, gym equipment, awnings, structures, and more. 6061 Aluminum Square Bar, an extracted aluminum product, is used in fabrication projects when the qualities of light weight and corrosion resistance are required. It is used in framework, braces, supports, trim, and shafts. It is easy to cut, weld, and machine. Our great service allows you to get the exact measurement you need. Shop for 6061 Aluminum Square Online! 360 Brass Square Bar is characterized by having strength, corrosion resistance, electrical non-conductivity and non-sparking qualities. It is used for a variety of purposes, including fittings, fasteners, and instruments. Because of its smooth gold appearance when it is polished, it is frequently used for decorative purposes. Shop for 360 Brass Square Bar Online! Cold Finish aka Cold Rolled Steel Square, a low carbon steel product, is easily machinable and easy to weld, cut, and form. A cold finish steel square has a smooth surface wish sharp corners and is more dimensionally accurate than hot rolled bars. It is frequently used in shafts, machine mounts, fixtures, and more. Shop for 1018 Cold Finished Square Online! Stainless Steel Square is the ideal product to use when greater strength and corrosion resistance are needed. With its dull and durable finish, it can handle exposure to acid, chemicals, and both fresh and salt water. Easy to weld, it is frequently used in frame work, braces, marine, and other applications. Shop for T304 Stainless Steel Square Online! Shop for T316 Stainless Steel Square Online! 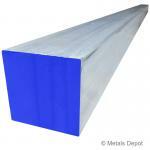 Hot Rolled Steel Square Bar, used for all general structural fabrication and repairs in industrial maintenance, has a grainy finish with radius corners. It is easy to cut, weld, form, and machine. It is used in frame work, supports, shafts and axles. 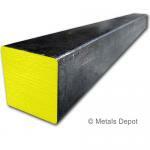 Shop for A36 Steel Square Bar Online!